The Model 375 is a low cost hydrostatic level transmitter providing quick, accurate and reliable level measurement. The Drexlebrook Model 375 is a submersible level transmitter specially designed to provide the convenience of direct submergence in many types of liquids for quick, accurate and reliable level measurement. It offers excellent linearity and repeatability, low hysteresis and long term stability. Not only is this level transmitter a low cost solution it is also a lighter weight option for submersible level applications. To indicate the level of liquid the hydrostatic pressure is continuously measured through the isolated sensing element of the transducer. All electronics are mounted in a submersible 316 stainless steel housing. A special cable support bracket is available offering extra stability to the transducer when used with longer lengths of cable (up to 2500 feet) or when used in an agitated liquid. The 375 level transmitter comes with an output signal of 4-20 mA. Additional input / output options are available as customized solutions. A specially designed cable is factory installed and sealed to insure liquid tight performance. 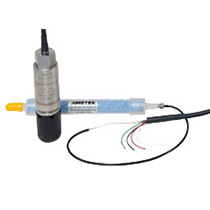 The customer connection end of the cable is sealed and a desiccant package is installed to limit the amount of moisture allowed to enter the barometric reference of the sensor. Due to its simple design and rugged construction the Drexelbrook 375 level transmitter provides long lasting service with virtually no maintenance.